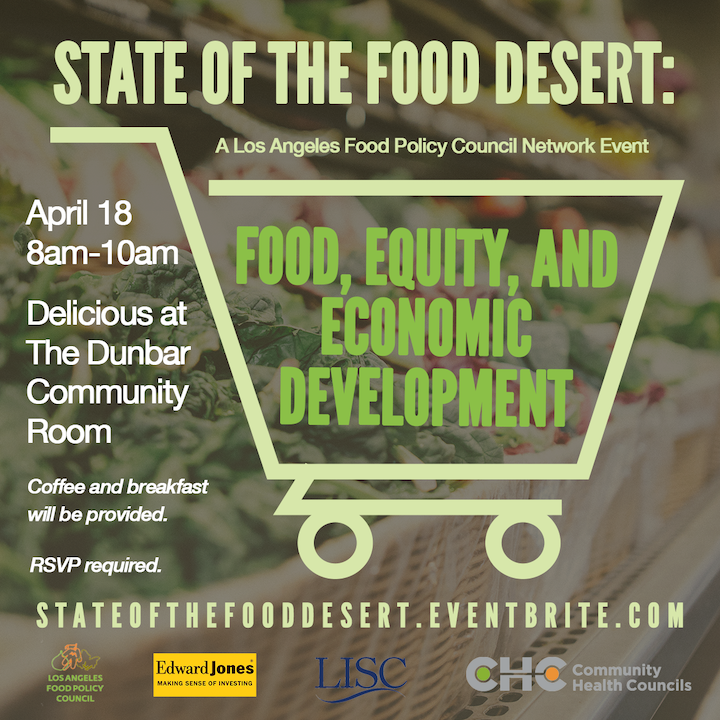 April 18: 8 a.m. – 10 a.m.
Over a million Angelenos live in neighborhoods where they cannot access fresh and healthy food. “Food desert” – also referred to as “food apartheid” – describes a neighborhood without healthy food options, often neighborhoods home to primarily people of color and low-income residents. Lack of access to fresh food results from historic divestment of communities of color through practices such as “redlining” by banks and government institutions, the effects of which still profoundly impact the health and economic vitality of Los Angeles neighborhoods. At this LAFPC Network event, we explore ways to fight food insecurity in Los Angeles through economic empowerment, jobs, entrepreneurship and investment in communities of color.